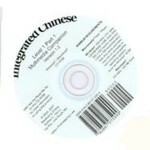 This CD-ROM, the first in a set of interactive multimedia companions to the Integrated Chinese series, adds a new dimension of flexibility and richness to Chinese language learning. Divided into sections of listening, speaking, reading, and writing, it features a wide variety of new interactive games and activities for students to test their skills and get instant feedback. A Challenge Corner combines language practice in all four language skills and tests students’ knowledge of grammar and culture through a series of fun, interactive exercises. The CD-ROM also includes dialogues, video clips, e-flashcards, character writing practice, and a dictionary — all in a user-friendly format with attractive flash animation and easy manoeuvering from one activity to the next. Includes both traditional and simplified Chinese characters. What's New in Version 1.2 The Integrated Chinese Level 1, Part 1, Multimedia Companion Version 1.2 has corrected the software bugs and errors from the previous version. Minimum System Requirements: Windows: 1.0 GHz CPU speed; 256MB RAM; 32MB video RAM; the ability to play mp3 sound files. Mac: PowerMac G3; 233 MHz, 128MB RAM.